Recessed paneled Rooms are also a speciality of ours also. These examples show different styles and different materials. These 2 on the left are Black Walnut with dental crown and soffet, They have recessed paneled beams with routered edge beams. The next two are Select Alder with recessed paneled beams standard. Note the different lighting locations. The Alder is unfinished and the Walnut is. See other pictures of same unit finished. The first room on the left is a Theater We finished early '09, it's select Alder with recessed paneling and silk padding, lighted soffit with a walnut stain. 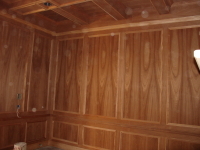 This next room is African Walnut with recessed paneled beams with wainscote mldg., unfinished. This next room is the first Alder office finished, with soffit, recessed paneled beams and routered edges. 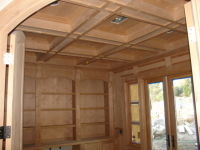 This next Office is also Select Alder with recessed paneled beams, finished in a Mahogany stain. This Beam Ceiling on the left above was finished recently, it's Select Alder with diagonal corner beams, recessed panels, finished Walnut. This is the opposite end of the same office. Below is the wainscote treatment we installed in the same office. These are the doors in one of of our earlier offices. This ceiling on the left below is Select Alder, unfinished with double 8" Alder base with 8" Alder Crown moulding, with recessed paneled beams. This Patio enclosure below was transformed from a ugly storage area to a plush patio, bar, office area with everything. These are pictures of other wall areas in the same room. Everything built-in, a wine room, bar & entertainment center. 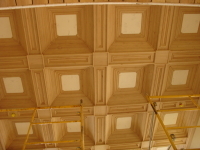 Here are are several different Custom Paneled rooms with coffered ceilings we have done in the past. This is one of our specialities, we really enjoy coming up with new ideas, so your special room has that one of a kind feeling. We will do all we can to create a unique working environment for you, the Homeowner. After years working in Custom homes around the county, I've seen some of the very best and worst. What we bring to the table is Custom experience and knowhow. We have many different styles to draw from. We can completely design your Office, Theater, or Library, from scratch if you would like, or go on your designs. Almost any design can be done. There are so many options, species of wood, designs, lighting, sound, cabinetry, mouldings, ceilings, your imagination is the limit.